This past holiday, Robert Loughran coordinated a citywide food drive to help the less fortunate at a time when help is most appreciated. His philanthropy project has raised more than 25,000 pounds of food for the needy across California. Called the Women's Transitional Center Food Drive, this annual event has arguably become the largest single-day philanthropic project sponsored by a resident, in Fullerton. His success is so impressive Robert became the first person to receive the Humanitarian Award from Elite Team Realty in 2001 — an award presented annually to associates and companies in Orange County. This award program was developed in honor of Robert’s service to his community. 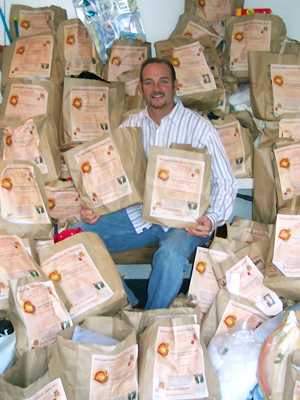 His food drive touches the lives of more and more people each year. With an increased effort in helping those who are less fortunate, he will continue to uphold the ideals of humanity for all to see by making a difference for the needy. Robert calls on the support of his team, at Robert Loughran & Associates, to make the event as successful as possible. With their help, he has been able to make a bigger impact with a jointed donation. “I think it’s important to promote community service in the workplace. Lucky for me, I work with professionals who have the same attitudes as I have,” said Loughran. The program works simple, yet effective. Robert's group drops off brown bags on the door steps of people in his surrounding neighborhood. Using a label with detailed instruction, he informs residents what can be donated and when the bag will be picked up. Remember that you can submit a person you feel deserves to be recognized. The editors will feature a new individual every month.